Services are to begin the evening of September 23rd and continue until the Last Great Day which is October 1st in 2018. Here is a link if you would like to see photos related to the Feast of Tabernacles' Sites for 2017 and as well as one for a video slideshowContinuing Church of God Feast of Tabernacles 2017 Slide Show. Some website links to outside sources are in this post, but this does not mean that they are endorsed by the Continuing Church of God. They are provided as additional sources of information–and hopefully some of that information may be helpful to you and your family as you begin to make plans for the 2018 Feast of Tabernacles. We have selected the Marriott Courtyard Alexandria Old Town/Southwest, located at 2700 Eisenhower Avenue, Alexandria, VA 22314-4553, (703) 329-2323 for our main site in the USA. Alexandria is near Washington, D.C.
An optional group activity that we intend to propose is going to the (free) Museum of the Bible, which is the newest museum in Washington, D.C. It is about ten miles away from the Marriott. Room rate valid 3 day prior and 3 days post the event. The Hotel’s room rates are subject to applicable state and local taxes (currently 14.5% +1.00) in effect at the time of check out. The group room rates listed above are net non-commissionable. Continuing Church of God will be responsible to pay any commissions due to any agency for this event. Please have the guests in your group directly call Marriott Reservations at 1(800) 321-2211 or (703) 329-2323 on or before Thursday, August 30, 2018, (the “Cutoff Date”) to make their sleeping room reservations. 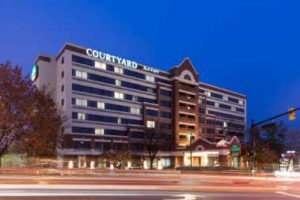 Please advise guests to identify themselves as part of the Continuing Church of God group staying at the Courtyard Alexandria Old Town/Southwest, located at 2700 Eisenhower Avenue, Alexandria, VA 22314-4553. Reservations for all guests must be received on or before Thursday, August 30, 2018, (the “Cutoff Date”). After the Cutoff Date, the hotel will release any unreserved rooms for general sale and, in the hotel’s discretion, will accept reservations at Continuing Church of God’s group rate, on a space and rate available basis. Since attendees have to pay for their own rooms individually, if you are attending in Alexandria, you DO NOT have to stay at this Marriott. There are many other hotels in the general area. However, many people will find that it is much more convenient to do so. And it does make our meeting room negotiations easier when we have more people who stay at the hotel location we hold services at. Sunday, September 23, 2018. Services: 7:30 pm. Monday, September 24, 2018. Services: 2:00 pm. Tuesday, September 25, 2018. Services: 9:30 am. Wednesday, September 26, 2018. Services: 9:30 am. Thursday, September 27, 2018. Services: 9:30 am. Friday, September 28, 2018. Services: 9:30 am. Saturday, September 29, 2018. Services: 2:00 pm. Sunday, September 30, 2018. Services: 9:30 am. Monday, October 1, 2018. Services: 2:00 pm. We also intend to have a semi-video site in the Wichita, Kansas area. Deacon Richard Close is working on having a limited site in Wichita, Kansas. 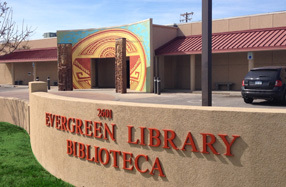 We have a contract to hold services at the Wichita Public Library, Evergreen Branch, 2601 N Arkansas, Wichita, KS 67204. At this instant, the plan is for Steve Dupuie to spend the first half of the festival speaking in Alexandria and the second half in Wichita. With Richard Close speaking the first half in Wichita and the second half in Canada. We may have a site in Mozambique. If so, this would be the first time--otherwise like 2017, they will go to Malawi. In New Zealand, we expect to have a site on the North Island. We have booked a venue for the Feast of Tabernacles. The venue is Academy Comfort Inn, 734 Cameron Road, Tauranga. Tauranga is just under 3 hours south-east of Auckland by car. Because the Meeting Room at 11th Street Bed & Breakfast was so ideal and covenient I have just reserved the same Room for Sep 2018 FOT. Its a tentative Booking but they will hold it for us with confirmation and payment to be in April/May 2018. Tripadvisor reports that there are 30 hotels and 226 restaurants in Bacolod. Bacolod has several museums and parks. If you plan to go there and have internet access and/or computer expertise, your skills could be helpful. A Feast of Tabernacles site is being planned for Novi Sad, Serbia in 2018. At this instant, we expect this to be our only European Feast of Tabernacles' site in 2018. Serbia is inexpensive by European standard. Having visited Belgrade twice, my family and I would say that people would find Belgrade, where outtsider would fly into, a nice place to visit. One can get by with the English language, despite the national language being Serbian. Novi Sad is popular with tourists to Serbia. TripAdvisor says it has 27 hotels and 256 restaurants. Novi Sad also attracts the visitors with its neatness, safe embeddedness by the Petrovaradin Fortress – the “Gibraltar on the Danube”, different languages spoken by its inhabitants, and the rhythm so untypical for hasty and chaotic pace of an urban community. The surroundings of the city core marked with baroque, neo-Renaissance, classicistic and Bauhaus buildings, reveals the picnic sites, preserved eco-systems and a complex of Orthodox monasteries settled in the territory of the National Park Fruška Gora. “Salaš“ farmsteads, “čardas“ and wine trails at the outskirts of Novi Sad provide the visitors the possibility to experience all the richness of gastronomy and rural customs. Novi Sad is the city that provides the visitors the agenda of unbelievably rich content with its urban core and rural surroundings. Each visitor, according to his or her internal feeling for nice and pleasant, attractive and joyful, useful and accessible can create his or her own experience while learning about all the layers of the past and present of Novi Sad. We do have some type of services available via the internet for those who cannot get to the USA, Canada, New Zealand, Kenya, Tanzania, Ethiopia, Malawi, Ghana, Serbia, or the Philippines sites. Sermons, offertories, and some other items are expected to be at the Sermons link at the www.ccog.org website and probably more will be in this article. We are in the process of putting together a couple of sermons online for the Feast of Tabernacles in 2018 before it begins. Here is a link to one: Christians are Ambassadors for the Kingdom of God. Here is a link to another: Behind the Work 2018: New Door and More! We have messages from 2017 and prior years that some may find helpful in 2018. Here is an opening night message: Feast of Tabernacles 2018 Opening Night Message. Here is a sermon message that was played at some sites in 2017: Holy Day Plan of Salvation. Here is a sermon message from Herb Haddon at the 2017 Canada site: Christians ... Strangers and Pilgrims? Here is a sermon length message that was played at many sites in 2017: Behind the Work 2017: Into Europe and Africa. Continuing Church of God Feast of Tabernacles 2016 This is a slideshow of photos related to 2016 and some Feast of Tabernacles-related activities.